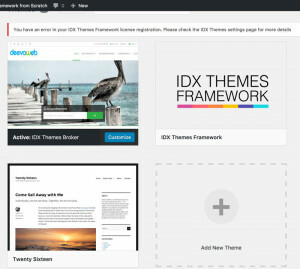 In this video, we cover how to install and activate the IDX Themes Framework and Child Themes. In this video, we cover how to install and activate the IDX Themes Framework and Child Themes. We will cover where you can find your file downloads as well as your framework license key so that you can keep your Framework and Child Themes updated as new versions of the theme are released. It is important to note that you only need your framework license key to keep both your framework as well as any child themes you are running updated at all times.